Its that time of year again… Christmas? Well, yeah, that too, but what I am referring to is less about holidays and more about something that happens to me any time something is coming to an end. 2012 is coming to an end, and for me that means a whole lot of personal reflection. I can’t help it, its what I do. I’d like to believe that every year as I look back over who I was when this year began compared to who I am now, I will see a change, I will see growth, I will see a man that listens more, talks less, and loves even better. The month of December is always filled with lots of different emotions for me as I consider who I want to be, and the many ways I fall short of that. Charlie Brown Christmas was just starting. About 10 seconds in I realized this was more than a movie, but a divine appointment. This would be the kick start to my season of asking hard questions about myself, looking back, and ultimately looking forward to what is to come. This was a great starting point. I started making notes on my phone as I watched the story unfold. No, this is not the first time I’ve seen this little cartoon, but this is certainly the first time I have ever been impacted by its story and characters. What’s coming on this page is not well thought out, its not neatly organized, it is just my scattered thoughts on a classic Christmas story that has much more to do with our lives than we realize. Charlie Brown’s Christmas is bad animation, the voice overs are questionable, and nothing screams 1980… Whatever, like the piano part that plays some 500 times over the course of a 30 minute program. But it works! I don’t know why, it just does. My eyes are glued, my mind is transfixed in the simplicity of the story, the bland colors, and the way their mouths change shape to show emotion. I actually find myself being relaxed by its slower pace and simple format. Simplicity is great, and somewhere in the depths of our souls we crave it, long for it, even need it to survive. We were not created for the rush and madness we have built, we were made for simplicity. Its why our eyes long for visions of snowy white mountain caps, our ears for the sound of babbling brooks and ocean waves, and our skin the warmth of a tropical breeze. We need simplicity, so find it, somewhere this Christmas season, and then, make a habit out of it. Cartoon relationships are the same as real ones. For whatever reason, the concept of fairness seems to be hardwired into the DNA of the human make up. All the way back to Eve in the Garden of Eden we see her being tempted by something she is, “lacking,” and that sense of lack, felt unfair to her, she felt like she deserved something more. From that point on, no human has been able to shake the fairness complex. We want the score to be even, we want what we are owed, and we believe in the value of fairness, and all it has done is turn us into self-seeking ego maniacs. Charlie Brown spends the whole movie struggling to understand the point of Christmas, the lights, the singing, the presents, etc. He trots slowly from one scene to the next interacting with the other kids in his life. They are kids right? Why are they all balding like 40 year old men (or 32 in my case)? Anyway, at one point in the movie he comes across his little sister Sally making her, “Christmas List.” She is going on and on about all the things she wants. Seemingly harmless words right? Maybe, but a statement I fear has so thoroughly shaped our culture that we will never be able to retrieve it from the quick sand that is our own selfishness and greed. Why does it need to be fair? Why do we need to compare our lives to others? Why does everything have to be even? The truth is, our pursuit of fairness makes us like a rat on a wheel. Fairness is, and will always be subjective in nature, and defined as much by our perspective on life, background and perception of the world than the facts. I long for a world not driven by fairness… Thanks for being frustrated with me Charlie Brown. 4. Linus’ blanket has got to smell really bad. Seriously, that thing is always on the ground dragging behind him. It’s gotta be funky. 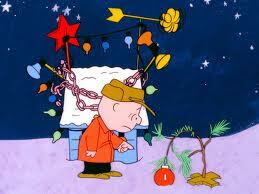 Charlie Brown is a thinker… Even an over thinker, and because of it, no one gets him. The root of his struggle with Christmas and the depression it creates is that he over thinks everything. While the world around him simply goes with the flow, enjoying the Christmas lights, programs and trees, Charlie is thinking. He is considering the implications of it all, wanting answers and seeking meaning. As a result, he is a total outcast. No one understands a thinker. During the story, Charlie Brown some how gets appointed as the director of the Christmas play. For the play he has to go pick out a Christmas tree. The scene begins with him standing amongst huge, full, colorful, beautiful Christmas trees for miles. He has a huge smile on his face, the first of the movie actually, and his gaze is fixed on a small, bare, dying Christmas tree hidden amongst the beautiful ones. He has no eyes for any others. This is his tree. I love Charlie Brown’s ability to see beauty in what it could be. I love his freedom to go against the cultural norm, to stand up for what he believes in, to see real beauty rather than fabricated beauty. It is the way Jesus saw people. It is the way I want to see everything. 7. Leaders will feel alone. When Charlie brings the tree back to set up for the Christmas play his friends all laugh at him. Most people don’t see life the way leaders do, and as a result, it tends to be an isolated and lonely existence. Leaders are called to see things that aren’t their yet, love things that are still unlovable, and value things that aren’t yet valuable. People like Martin Luther King, Abraham Lincoln, Rosa Parks, Martin Luther, and well, ok, Jesus, lived their lives this way, for this purpose, and the result was a whole lot of aloneness and misunderstanding. Leading isn’t easy, but it is powerful. 8. Christmas is a very simple holiday. I know, at face value, it is anything but simple. It is an organizational nightmare. Parties, families, food and presents. We run from one thing to the next, stand in lines, wait in traffic. The reality is, the Christmas season is utter madness. I don’t have to tell you that. The problem is, the madness we feel is something we have created. The complexity we sense is self imposed. Christmas my friends is incredibly simple. As those words role off his tongue, I have goose bumps on every inch of my body. This is what Christmas is all about. This is why we celebrate. It is the birth of our long awaited savior. It is less about Jesus being born, and more about what his birth means, what it brings, what it lavishes upon all man kind. Christmas is a beautiful holiday filled with all kinds of opportunities to love, laugh and enjoy the things of this world, but we can never forget the simplicity of it all. 9. I can learn from anything. I am struck by how this children’s show, caused change and growth in my own life. I want to be a life long learner. That is why I choose to reflect. I don’t want to be the same person I was last year. I want to see growth in my character, I want to love the things of this world less, and the people in my life more. I want to loosen my grip on me, and embrace the reality of others. Thank you Charlie Brown for reminding me to never stop learning.